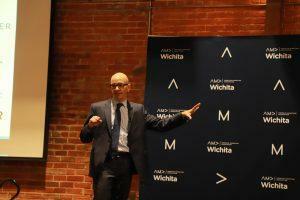 At AMA Wichita’s recent luncheon, “Retail Marketing: Alive and Well,” Simon Property Group’s Josh Ginsburg spoke about how the company has adjusted its approach to attract shoppers by providing them high quality experiences. During his presentation, Ginsburg said the reason Simon Property Group has been able to survive the popularity of online shopping by creating an space where consumers want to spend an entire day. Gone are the days of mega department stores anchoring the edges of a mall. Today’s mall landscape, according to Ginsburg, includes social interactive opportunities, tactile experiences, and a clean refurbished environment. “We look around the corner and develop cutting-edge strategies to elevate the perception of Simon,” says Ginsburg. Simon’s premier shopping centers are made up of 115 Regional Malls, 16 The Mills, and 78 Premium Outlets. Whether they’re providing unique world class outdoor shopping or iconic destinations, Ginsburg said Simon leans on their ability to use scalable media to communicate to their target market. “We utilize our properties to tell our stories,” says Ginsburg. Ultimately, whether shoppers are attracted to campaigns, mall events, or prefer personalized service, they are still shopping at Simon’s brick and mortar properties. 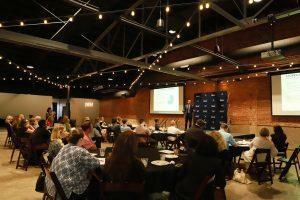 Save the date to attend our annual Wichita Marketing Awards “Amplify” ceremony on June 21. We welcome keynote speakers Evan Carroll and Stan Phelps from the AMA Triangle Chapter, published authors and celebrated speakers and volunteers. Stay tuned for a link to purchase tickets! Be sure to purchase your tickets for our next monthly luncheon “Marketing vs. Sales – Davis Wilson, UPS” on July 19.